Recently, we have covered how to track your mailing list signups using Google Analytics as well as how to grow your B2B list using LinkedIn Ads. Now, let’s look at how any business – B2B or B2C – can use Facebook ads to increase mailing list subscribers. As mentioned in the LinkedIn Ads post, the best way to capitalize on your advertising dollars to build a mailing list is by having a squeeze page (i.e., a page whose call to action is an opt-in form) with a great giveaway that interests your target audience. To track it in Google Analytics, use the URL Builder to append UTM parameters to your squeeze page URL like this. 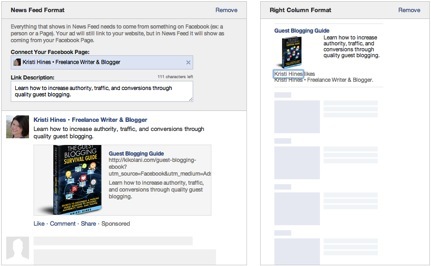 Once that’s ready, you can start experimenting with two advertising options on Facebook to get exposure for your squeeze page and start building your mailing list. There are two ways you can advertise your squeeze page on Facebook. The first is by posting it to your Facebook page’s wall and then using the Boost Post option. This option is available for Facebook pages that have over 400 likes. When you choose to boost your post, you have two options. You can select to show the ad to people who like your page and their friends. You can also choose to target specific people throughout Facebook, regardless of their connection to your page. 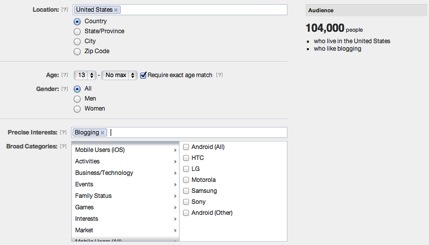 The targeting options are for location, age, gender, and language. The budget range for each of these Boost Post Promotions vary based on your current number of fans, but the option to target people gives you the option to choose a higher budget and even more exposure. The second Facebook Ad type can be created using the traditional Create Ad interface. 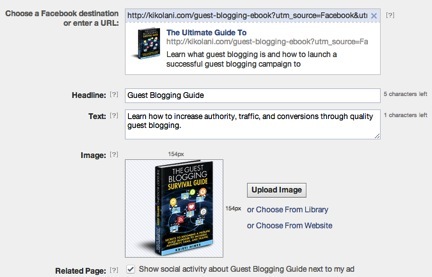 Here, you can enter the URL of your squeeze page (plus UTM parameters) as the destination. From there, the first thing you will do is customize your ad’s title, description, and image. Also make sure that your image is less than 20% text as it might cause the Facebook Ads team to not approve your ad. 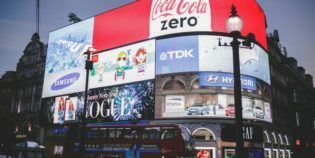 Next, you will associate your ad with your Facebook to get your ad positioned in the newsfeed and see how your ad looks in both the Newsfeed and right column of Facebook. Next, you’ll define the target audience for your ad. 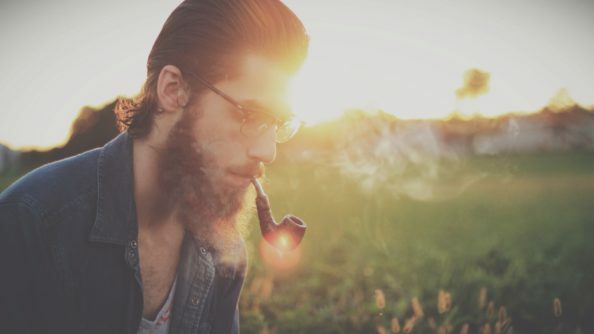 This will include basic demographics along with interests. You will see the target audience size change each time you change a targeting options. 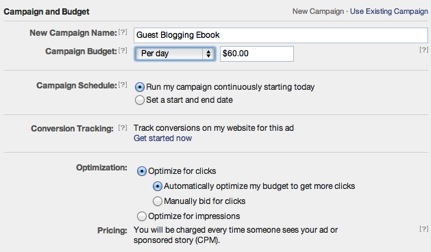 In regards to your budgeting, you will want Facebook to optimize for clicks instead of impressions, as the main goal is to get mailing list subscribers, not exposure. Thus, if people don’t click on the links, they won’t subscribe. Once specified your budget and set up your payment method, you’ll be all set! Throughout and at the end of your Facebook Ads campaign, you can track your progress a number of ways. 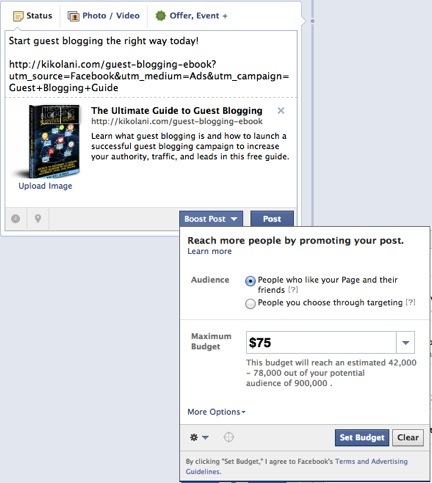 First, if you use the Boost Post option, you can go to the post on your wall and see the overall reach of your ad. By clicking on the number, you can see the breakdown between organic and paid traffic. 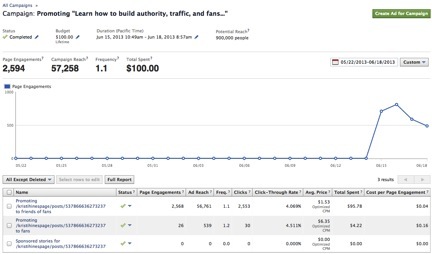 Next, you can visit your Facebook Page Insights to see the metrics on the post you promoted. Using the dropdown, you can look at engagement rate, number of times the post was hidden or marked as spam, or specific breakdown between likes and shares. You can also go to your Facebook Ads manager to see analytics about all Facebook Ad types. Last, but not least, you can also use your own Google Analytics to see if traffic from your ad has converted into subscribers. If you used UTM parameters, you can go to Traffic Sources > Sources > Campaigns, click on the campaign name you gave your ad, and click on Goal Set 1 at the top of the explorer window to see if your ads led to conversions. Otherwise, you can simply look at your incoming Facebook traffic in relation to your Google Analytics goals by going to Traffic Sources > Social > Conversions. Have you used Facebook ads to grow your mailing list? What were your results?